Welcome To Scooters 'N Chairs: Your Home For Mobility Scooters & Electric Wheelchairs! The Merits Vision CF Power Chair has a weight capacity of 300 lbs. and a compact, lightweight design. 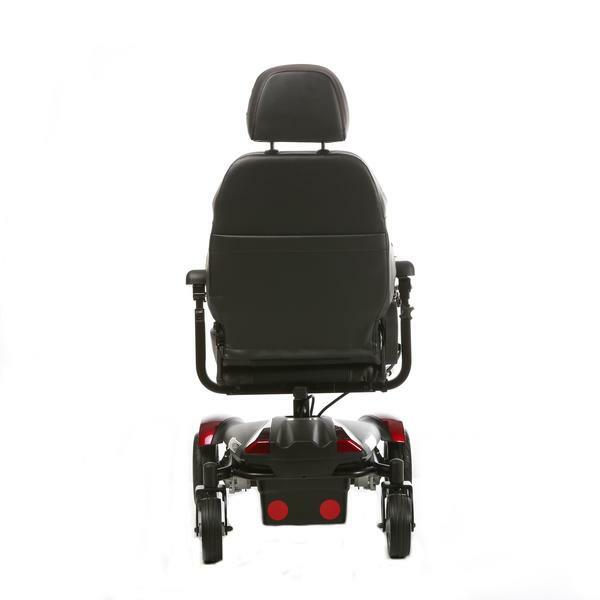 With excellent maneuverability, the power chair has a simplified frame construction, detachable height and width adjustable armrests, and removable, replaceable seat and back covers. Our experts at www.scootersnchairs.com are happy to see your needs are met! Corporation warrants to the original purchaser of this wheelchair product that it is free of defect in material and workmanship and that, when operated within the guidelines and restrictions of this manual, will remain so free of defect in material and workmanship for a period of One (1) year from the original date of purchase. Excluded from this warranty is failure due to negligence, abuse, accident, operation outside of rated limits, commercial or institutional use, damage / wear to upholstery or tires and improper maintenance or storage. 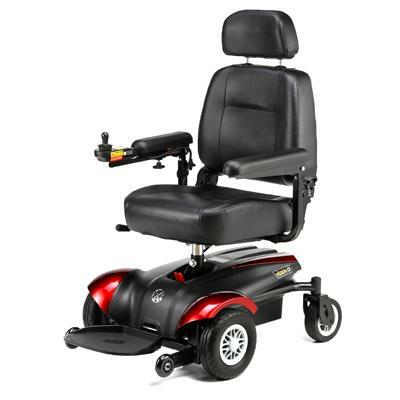 the batteries for this wheelchair product are not supplied by corporation, contact the battery manufacturer / supplier if warranty replacement is requested. This wheelchair product must not be modified in any way without the express written consent of Corporation. Any such unauthorized modification could cause unreliable and / or unsafe operation and will void this warranty. 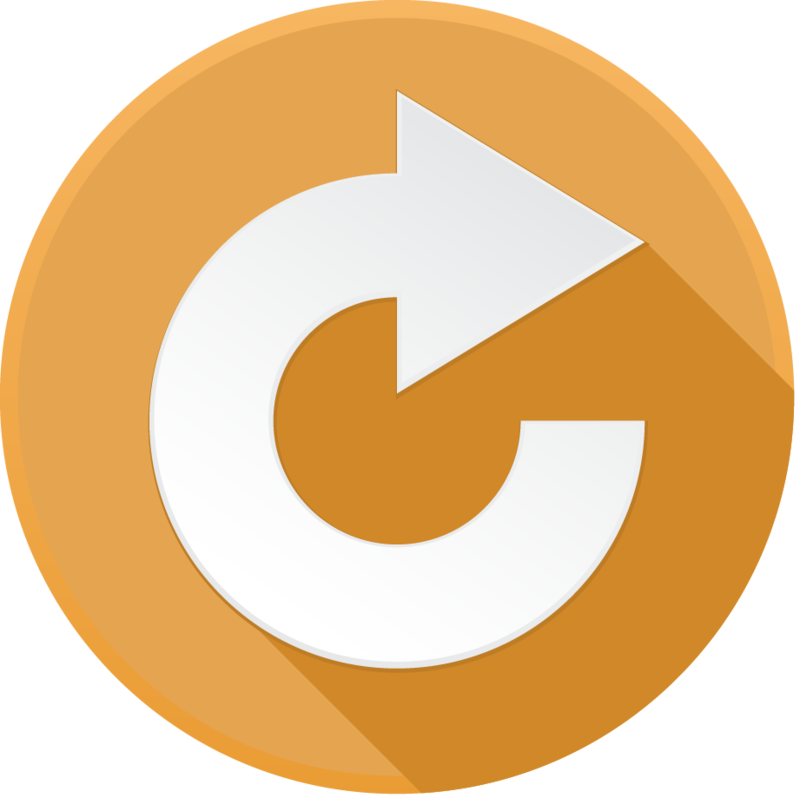 Where a failure occurs within the 1- year warranty period that is not excluded above, the failed components will be replaced with similar new or reconditioned components at sole option. Corporation will not be responsible for labor and / or shipping charges. 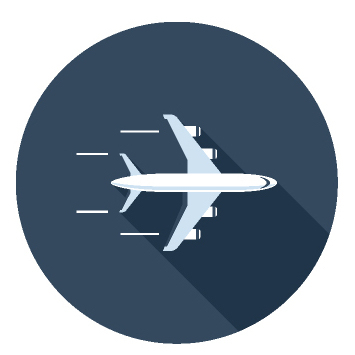 The foregoing warranty is exclusive and in lieu of all other warranties expressed or implied including, but not limited to, the implied warranty of merchantability and fitness for a particular purpose. 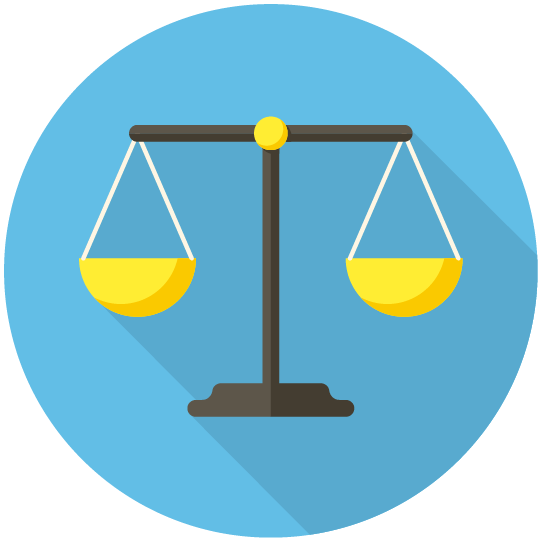 Corporation will not be liable for any consequential or incidental damages whatsoever. 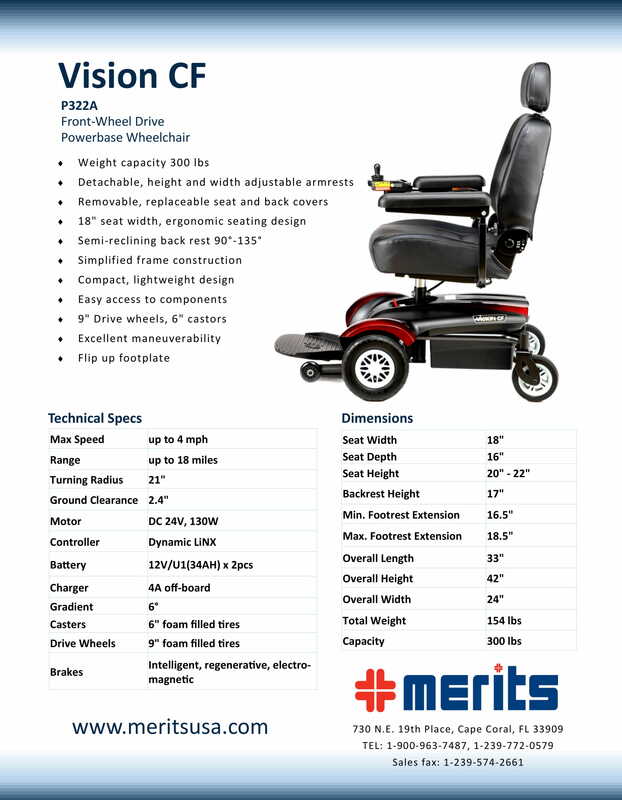 Merits: Vision CF Power Wheelchair has a rating of 4.5 stars based on 6 reviews. 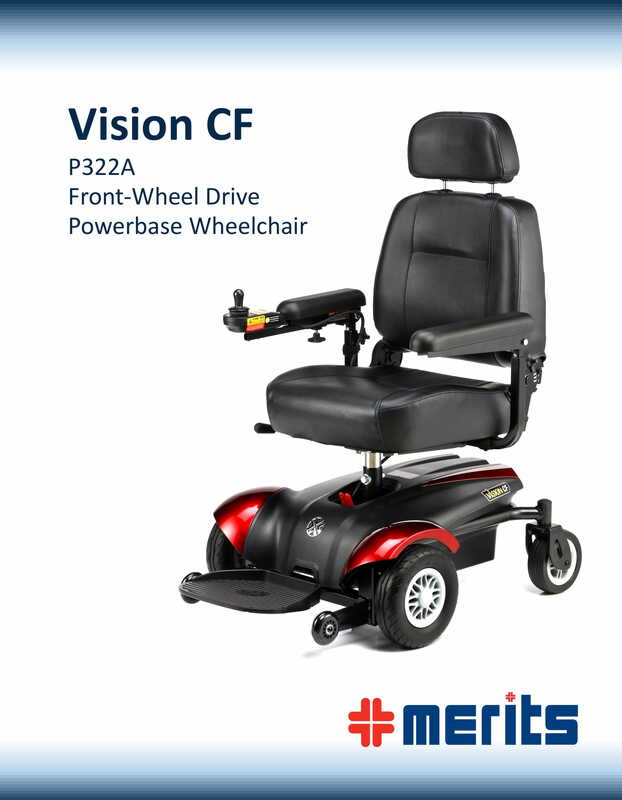 Why Merits: Vision CF Power Wheelchair? The Merits Vision CF Power Chair has a weight capacity of 300 lbs. 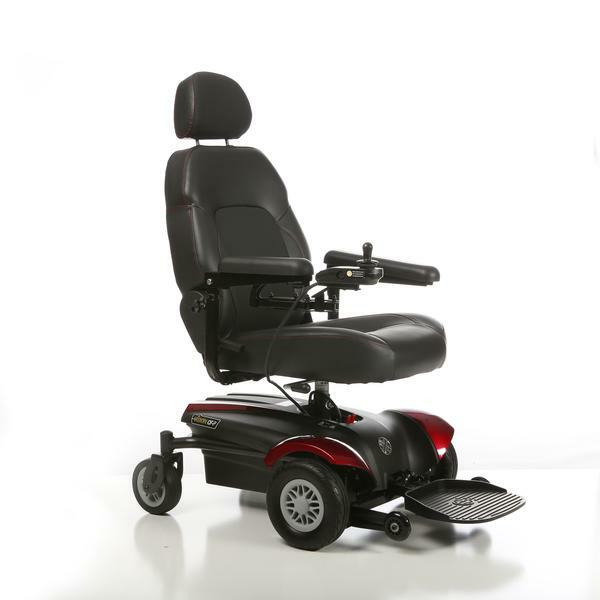 and a compact lightweight design and excellent maneuverability. The power chair has a simplified frame construction, detachable height and width adjustable armrests, and removable seat and back covers. VIDEO: What Makes Us Unique? Enter Your Email To Receive Our Exclusive Offers Today! © 2019 Scooters 'N Chairs. All rights reserved.